To add on to your Halloween fun, make sure to try these FREE Halloween bag toppers (great party favors), these Halloween appetizers, or these Halloween Oreo Pops. 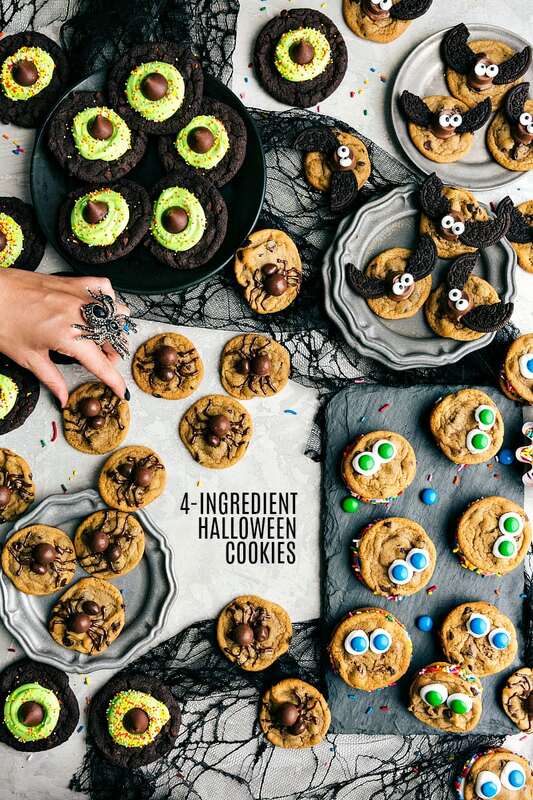 Above this image is a quick (1 min, 30 seconds) video overview that will show how simple these Halloween cookie recipes are to make! 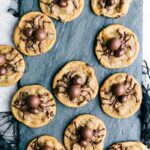 The recipes below are intended to be simple and quick to make if you’re in a pinch and need a last minute Halloween treat (or in case you just don’t love baking!) If you love baking and have the extra time, I’ve shared how to make each of these cookies from scratch as well. Enjoy and Happy Halloween! Prepare these cookies (with or without the caramel center and substitute extra chocolate chips in for the M&Ms) as the base! Once you have the cookie base finished, refer to instruction #2 to continue creating these cookies! 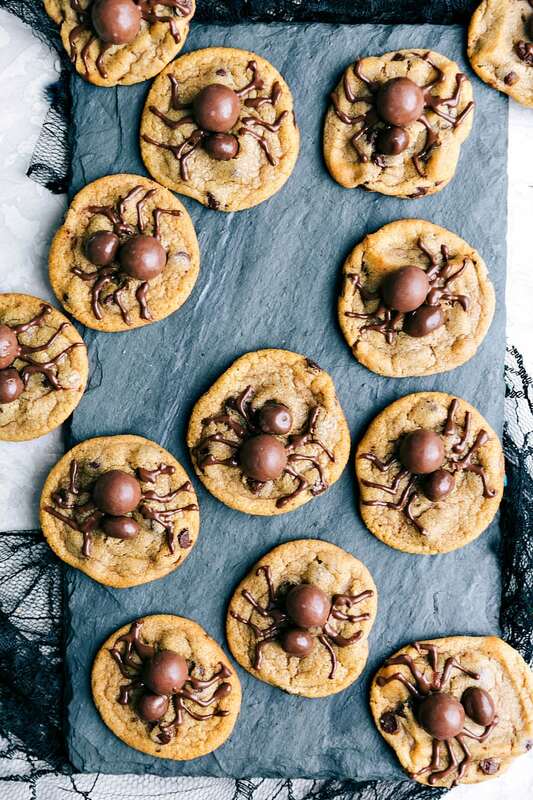 Easy 4-ingredient Spider Cookies; the perfect treat to add to your Halloween cookies platter. Preheat the oven according to cookie package directions. Bake cookies on parchment or silpat lined baking sheets according to package directions. Once cooled, place the chocolate chips (and shortening/oil if desired; makes it a little easier to drizzle) in a microwave safe bowl. Microwave in bursts of 15 seconds, stirring in between each burst for 10 seconds until the chocolate is melted and smooth. Transfer the melted chocolate to a piping bag fitted with a #2 or #3 tip OR into a plastic bag. Seal the plastic bag and cut off the very tip with scissors. Pipe "spider legs" connecting from the whopper out to near the edge of the cookie. Allow to set up at room temperature. Best enjoyed within 2-3 days. *Not a fan of store-bought cookies? Click the link above this recipe for my favorite homemade cookies! 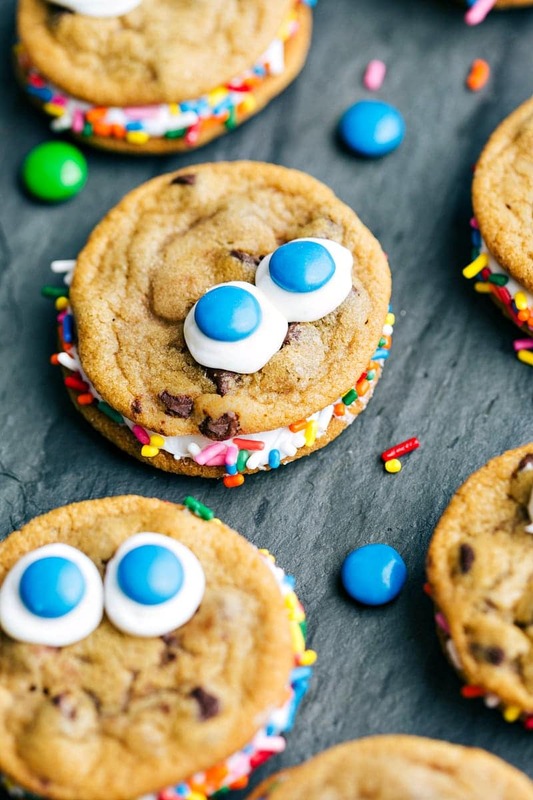 Prepare these cookies (with or without the caramel center and substitute extra chocolate chips in for the M&Ms) as the base! 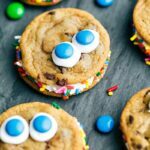 Prepare this frosting recipe (minus the cinnamon) and follow the rest of the instructions to make your cookies look like monsters! For a fun twist, you could make these snickerdoodle cookies as the base, fill with cream cheese frosting, and roll in cinnamon sugar instead of sprinkles! Remove from the oven and let cookies cool completely. Once cooled, add frosting to the inside of 12 cookies. Take the remaining 12 cookies and top each frosted cookie with another cookie to make 12 total cookie sandwiches. Press the sandwiches down gently but enough that the frosting oozes to the edges of the cookies. Take the remaining frosting, and add it to a plastic bag. Cut off the tip of the bag and "pipe" 2 round circles onto the top of each cookie sandwich. Press an M&M onto each round circle to form 2 "eyes". Best enjoyed within 2-3 days. *Not a fan of store-bought cookies or frosting? Click the link above this recipe for my favorite homemade cookies and cream cheese frosting! Prepare these cookies (with or without the caramel center and substitute extra chocolate chips in for the M&Ms) as the base! Follow the rest of the recipe to decorate with “bats” on top. Remove from the oven and let cool for 1-2 minutes and then press an unwrapped rolo candy into the bottom section of each cookie. Let stand for a few minutes and melt down a bit. The rolo should get melty enough to hold on the eyes. If not, you can use some chocolate chips + shortening (melt in the microwave and stir to combine) to pipe melted chocolate to the back of the eyes and attach to the top of the rolo. 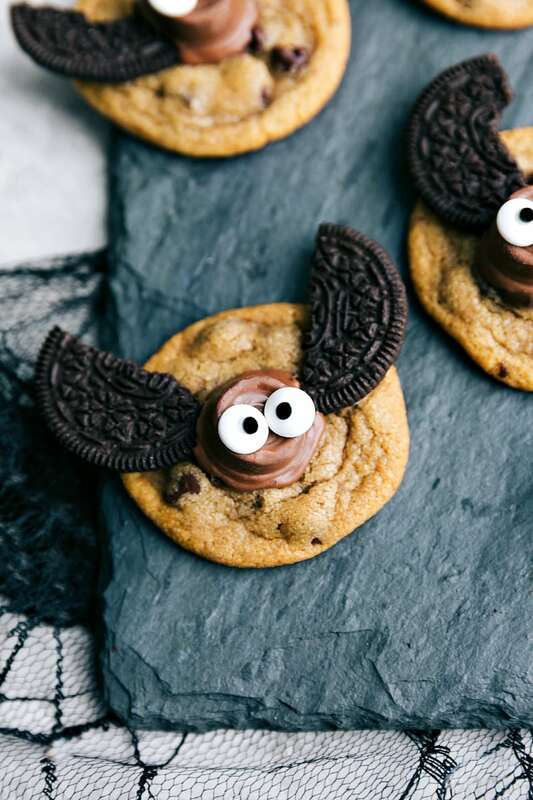 Alternatively you can also make these cookies without the eye candy addition -- they still look like cute bats! Prepare these cookies as the base and this frosting recipe (minus the cinnamon). 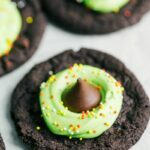 Dye the homemade cream cheese frosting with green dye and follow the rest of the instructions to make your cookies look like a witch’s hat. 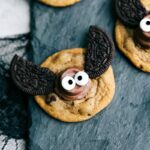 4-ingredient cookies made to look like witch hats! Remove from the oven and allow the cookies to cool completely. Dye the frosting if desired and transfer to a plastic bag or piping bag fitted with an extra large pastry tip. If using a plastic bag, cut off the tip with scissors. Pipe a round blob of frosting in the middle of the cookies. 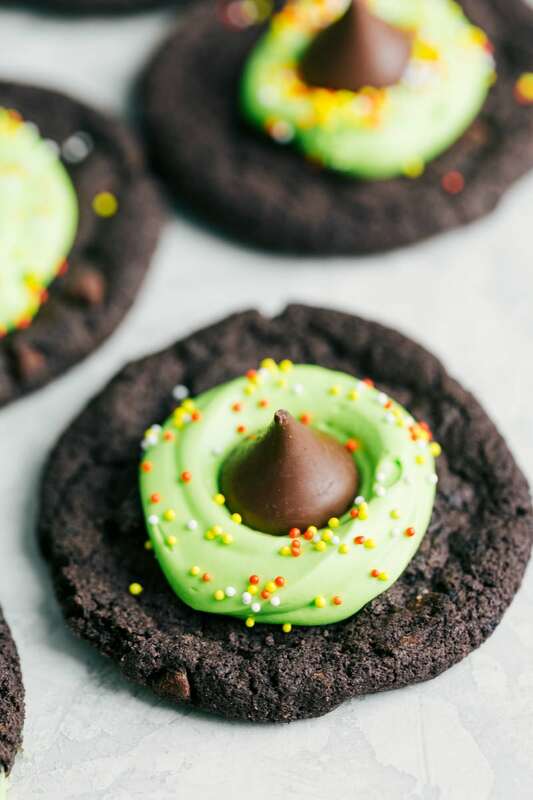 Press a chocolate kiss into the middle of the frosting. Add sprinkles if desired around the kiss onto the frosting. *Not a fan of store-bought cookies or frosting? Click the link above this recipe for my favorite homemade cookies and frosting. Love these Halloween cookies! Perfect project for kids as well. love the bats, how much fun, thank you for all of this Halloween inspiration!